However, there is a more sinister aspect to the current global trade wars, which were launched by the United States under the Trump administration with a round of tariffs aimed at adversaries such as China, as well as allies like Canada. While it is true that China has a lopsided balance of trade with the US, the American economy had been thriving under the former system. US companies depend on Chinese-made components, and American consumers enjoy low-cost Chinese products. In light of the latest US tariffs imposed on Chinese goods, valued at US$ 200 billion, economists wondered why the heavy-handed approach of ever-increasing tariffs was necessary while negotiations may possibly be carried out to address balance of trade issues. The reason is not good economics but US politics. Anti-foreign sentiments have been stirred up by the US President, who uses foreign trade as a sub-theme. There is also an overtly aggressive element to this: Washington imposing its economic might because it can. In other words, bullying. To China, there is another sinister motive involved, and this one impacts all US trade partners, including Africa. Beijing believes that the US is using trade war in a way very much like real war, to attack a foreign rival and undercut its economy. China feels the US wishes to reverse China’s impressive economic gains, lessening its competitiveness as a global trade partner, and undercutting its rise as an economic powerhouse. 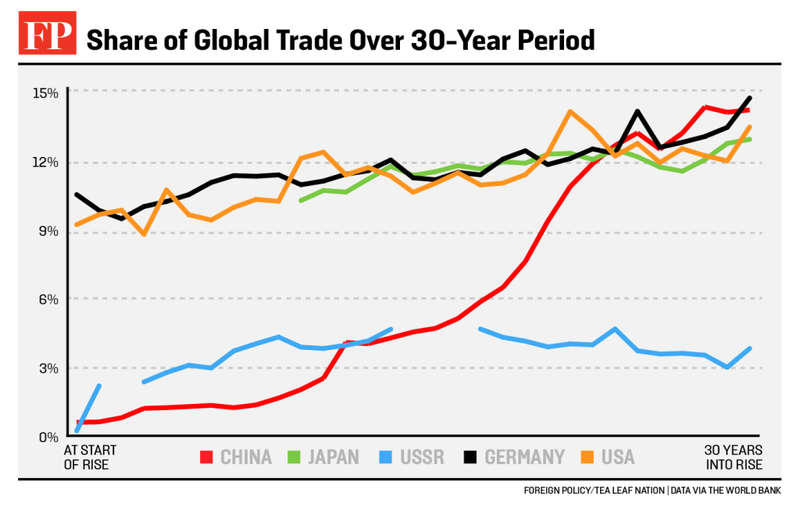 China is rising as a global economic powerhouse, expanding its share of global trade faster than any of the other rising powers in 30 years of ascent. This concern might also be held by African countries. With the US economy booming, there is no need to strong-arm impoverished African countries on trade issues, making demands, setting ultimatums and imposing sanctions instead of talking things through. However, Mr Trump is not a statesman but a businessman, who sees business as a zero sum game in which other countries gain only at the US’ expense. Consequently, he is baffled by the need for the African Growth and Opportunity Act (AGOA) because it allows qualifying African countries tax-free and quota-free access to the American market. Meanwhile, US products are still taxed when imported into Africa. Mr Trump finds this ‘unfair’, fundamentally misunderstanding the goal of AGOA. This trade initiative is intended to give African economies a boost so that they will become robust and eventually become better customers for US goods, while also becoming more stable and secure through their stronger economies. AGOA provides trade give-aways for the US’ long-term benefit. Rwanda has rejected the importation of US used clothes, at the expense of US-Rwanda trade relationships. The decision is in line with the argument that African nations must seek a variety of trade options, with inter-African trade, which is currently relatively low, being one. China presents another option. In August, the China-Africa Summit for 2018 found heads of states from most African countries and from all of Africa’s largest economies meeting in Beijing for a week of deal-making. Beijing committed US$60 billion in new development deals to the African continent. In turn, African leaders dismissed worries of political commentators that China is engaged in a neo-Colonial take-over of Africa by means of tying countries down with huge debts. 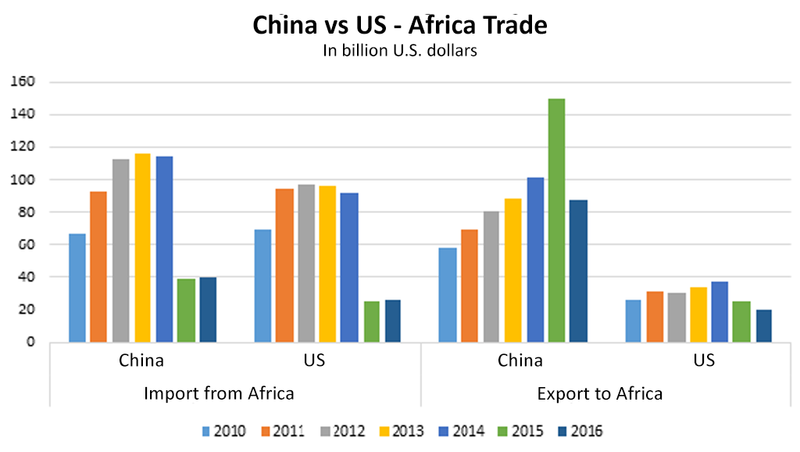 China’s trade with Africa has considerably increased over the years, overtaking the US as Africa’s leading trade partner both in imports and exports. Resistance to the Zambian government’s huge Chinese debt load is considerably vocal in Lusaka. However, through such trade alliances as the BRICS (Brazil, Russia, India, China, South Africa) development group, China has positioned itself as a partner in Africa against the West’s economic hegemony. The US trade wars and heavy-handed trade tactics in Africa go a long way to give credence to the “us versus them” rhetoric that originated with Mr Trump. Less confrontationally, the disharmony caused by the global trade wars should allow African governments to reassess their trade practices and priorities, and strategise ways to get the best deals from the type of customers they want. 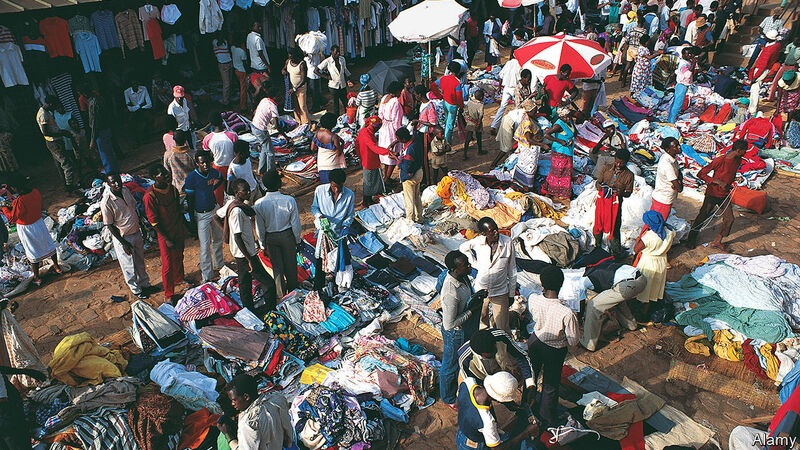 A second-hand clothing market in Kigali losing out in Rwanda’s second-hand clothes war, as the government hikes import duties on US used clothes. Africa can turn US trade demands to its benefit by expanding inter-African trade and pursue other foreign trade partnerships through skillful trade negotiations in natural resources. The China-Africa Summit in Beijing in August 2018 displayed a paradigm shift toward better trade relations with Beijing, even as worries rise about neo-Colonialism in the form of massive state indebtedness to China.